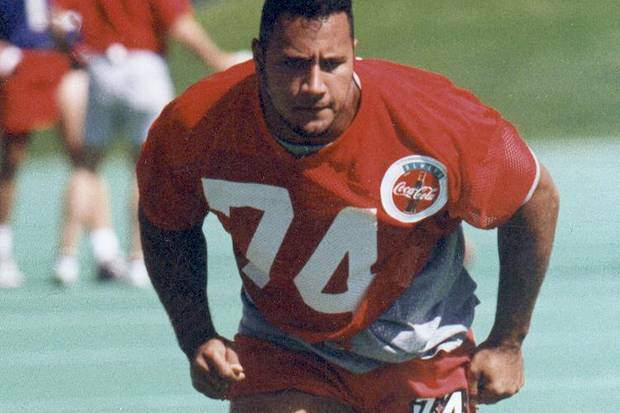 Dwayne “The Rock” Johnson’s time playing for the Calgary Stampeders in 1995. It was tradition for the Calgary Stampeders: After every home game, players filed into the clubhouse to relax, and meet up with their spouses and kids. In the summer of 1995, many heads would turn as a young defensive lineman with immense shoulders and massive thighs strode in. "He was like a Greek god," former Stampeder Stu Laird says. "The wives all loved him." That much-admired athlete was a former University of Miami player with NFL dreams relegated to a CFL practice roster and earning $300 a week. In short order, he was cut from the team and dispatched back to Florida, where he sank into a deep depression at his parents' Tampa apartment. But 22 years later, that player – Dwayne Johnson – is one of the world's biggest movie stars. He is in Vancouver now filming the action flick Skyscraper and posting on Instagram about his love for British Columbia's largest city. He first visited there with the Stampeders for an exhibition game against the BC Lions. For Mr. Johnson, 45, coming back to Canada is a return to the place where his football ambitions died. But it was his unremarkable performance in Calgary that pushed him back towards the family business of wrestling, a move that made him famous, and opened the door to Hollywood action roles. Mr. Johnson's former teammates, who were successful in the much smaller arena of a Canadian sporting institution, have watched his prodigious rise with pride, and awe. "Now he could probably buy the whole league," Mr. Laird quips. Mr. Johnson is today one of the highest-paid celebrities in the world, earning $65-million (U.S.) in the first six months of 2017, according to Forbes, with dozens of movies, ads and other productions under his belt. 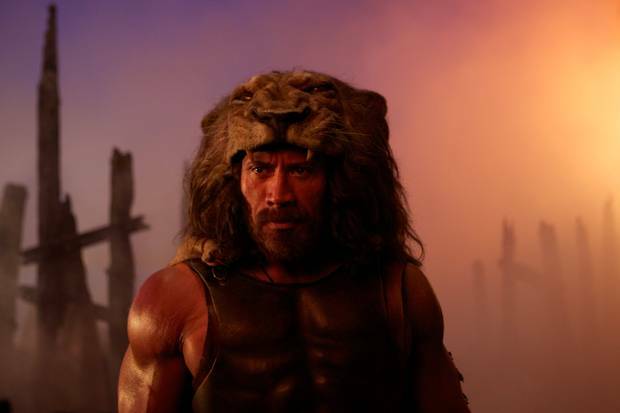 The hulking athlete left Calgary and quickly became a star in the World Wrestling Federation (WWF, later World Wrestling Entertainment), and then moved to film in 2002's The Scorpion King. His long list of features since includes Fast & Furious films, San Andreas, Disney's Moana and the upcoming Rampage. Hollywood loves him because he is a global figure who appeals to men and women of all ages and backgrounds. Not completely satisfied with his current lot, Mr. Johnson is also musing about a run for president of the United States – an idea not easily dismissed in the age of Donald Trump. His Alberta experience is not one he always speaks of with affection, but it is a key part of his rags-to-riches story. Mr. Johnson started with the team in the spring, but wasn't a stand-out player. He also came in at a time when the Stampeders already had one of the best defensive lines in the league, including Mr. Laird, Will Johnson and Kenny Walker. "It was one of those deals where he was never really going to get a good break unless someone got hurt, and we stayed pretty healthy that year," recalls long-time Stampeders equipment manager George Hopkins. "You do remember certain people …You could see that he had a charisma, he had that dazzling smile even back at that point," Mr. Hopkins adds. "But he was deferential to the veterans." Soon, Mr. Johnson was relegated to the practice squad. That knocked down his salary to subsistence levels, and left him crowded into a cheap apartment with other practice-roster players, surviving on Spaghettios. "He was starving. He couldn't go anywhere except back to his Motel Village and his squalid little room there," says Bruce Hart of the famous Calgary wrestling family, who knew Mr. Johnson through his Nova Scotia-born father Rocky Johnson, a well-known wrestler in the 1960s, 1970s and 1980s. While his time in Calgary might have been a low point, Mr. Hart and other Stampeders also remember good times for the well-liked Mr. Johnson: Free food from northwest Calgary institution Nick's Steakhouse & Pizza, and a handful of invites for home-cooked dinners. Former teammate Lubo Zizakovic says he and his brother Srecko, who shared a basement apartment near McMahon Stadium themselves, had Mr. Johnson and other players over for dinners of roast or turkey. Mr. Zizakovic, now an investment banker in Toronto, remembers being first impressed by Mr. Johnson in an initiation ceremony where all the rookies were forced to sing for their teammates. Mr. Johnson, whose mother is Samoan, did a Samoan war dance that reminded Mr. Zizakovic of the Haka performed by New Zealand rugby teams. "It was cool because we would never get to see anything like that. There are more and more Samoan-based players that are doing really, really well in football. But we didn't have a heck of a lot of them in Calgary," Mr. Zizakovic says. "It was the coolest thing any of the rookies had done. And he got a standing ovation." In his 2000 autobiography, Mr. Johnson wrote of borrowing a teammate's truck to go pick up used mattresses from a hotel dumpster to furnish the apartment he shared with three other practice-roster players. Mr. Zizakovic says that truck was his Chevy, nicknamed Big Red, which Mr. Johnson – an avid fisherman – also borrowed to go on trips to the Bow River and the Glenmore Reservoir. "He was on the practice squad so he wouldn't travel with us to away games. And so he always asked to borrow the truck and go fishing," Mr. Zizakovic says. Two months into the regular season, then-Stampeders head coach Wally Buono was planning to cut Mr. Johnson from the team. The process was sped-up after Mr. Johnson's agent called with news of a wrestling gig back in the United States. Mr. Buono said he remembers telling Mr. Johnson: "I don't want to screw up that opportunity for you." Unable to afford the cost of a taxi to the Calgary airport, Mr. Johnston got a ride from Mr. Walker. He has often recalled that it was after his flights from Calgary to Miami that he realized he had barely any money in his wallet. His production company and YouTube channel are named after that moment of clarity: Seven Bucks. Mr. Johnson stayed indoors in Tampa licking his wounds for a few weeks, and then started training for wrestling. The rest is history. He and Mr. Buono have tweeted at one another in recent years, with The Rock saying Mr. Buono was a class-act mentor who "has no idea what cutting me did for my psyche and drive." Mr. Buono is now with the BC Lions, and the long-time CFL coach is still hoping for a reunion with the player he remembers as a "good guy" with a huge personality. "As famous as he is, as well off as he is, when I see him, I see who he was. He hasn't changed."